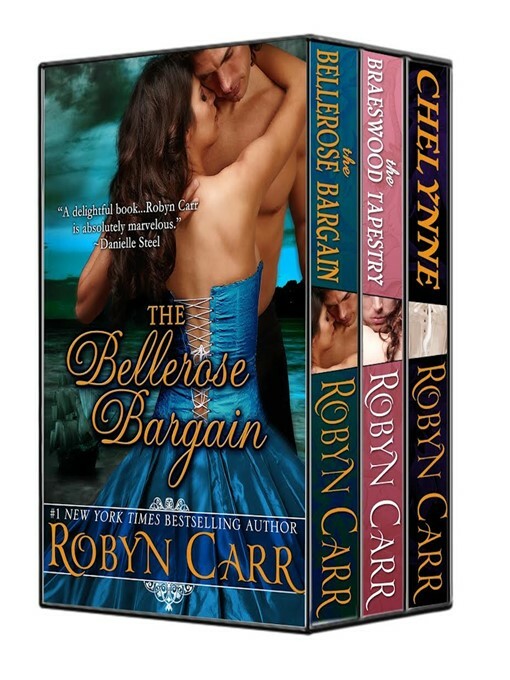 Three restoration novels in one set from best-selling author Robyn Carr. Fans of Virgin River are going to love these historical romances written with Robyn's trademark zest for life. In The Bellrose Bargain, the heiress to the Bellerose estate has gone missing and what a waste of a dowry it is! Enter Alicia, a tavern maid of uncertain parentage. No one at court has actually ever sees Lady Bellamy, and Alicia's beauty, poise, and bearing are enough to fool the king. At least, that's what Geoffrey hopes. Alicia charms King Charles II's court, but did her "business partner," have to be so dashing, tempestuous and irresistible? Worst of all, someone at court knows Charlotte Bellamy. The truth of Alicia's past and the lies of her present are about to collide. Orphaned and raised by her uncle, the feisty 16-year-old Chelynne shows her gratitude by marrying the man of his choice. Bracing herself for a sickly noble, the last man she expects for a husband is the dashing future Earl of Bryant. Being a loving wife doesn't seem too hard. He spurns her affection and remains her husband only in name. He resolves to keep his distance from everyone. Chelynne will go to any lengths to save their marriage. But when she goes too far, the Earl must share his dark secret before Chelynne loses her reputation—or her life. In The Braeswood Tapestry, the enemy of your enemy is...your lover? A peasant farm girl has no place consorting with feuding lords, yet that's exactly what Jocelyn Cutler sets out to do. When her brother is sentenced to death for rebelling, Jocelyn appeals to the lord's rival. Rumors mark him a highwayman, a murderer, and a heartbreaker. But he's the only one who can save her brother. The price? Jocelyn. Their life together hangs in the balance when an ancient crime resurrects from the past. Jocelyn and Trent must decide what to forgive, what to fight for, and how far they're willing to go for duty, family, and love.